There are a few irregular survey dates (several missing and a few not on Wednesday due to holidays). We adjust SPY return calculations accordingly. The following chart compares the weekly level of SPY and the weekly NAAIM Exposure Index (NEI) over the entire sample period. The average weekly value of NEI over the sample period is 61. It appears that the two series generally move together, but the much higher volatility of NEI makes comparison by visual inspection difficult. To test the aggregate foresight of survey respondents, we relate weekly NEI to next-week stock market return. 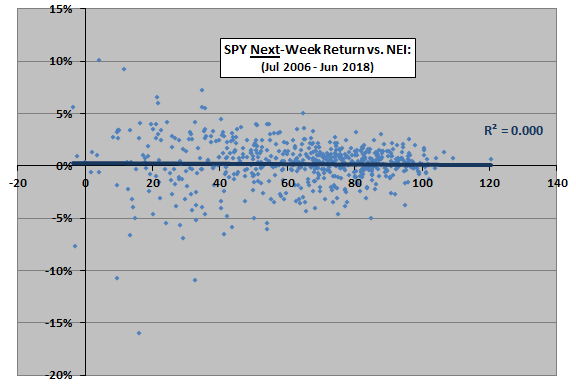 The following scatter plot relates SPY next-week return to weekly NEI over the entire sample period. The Pearson correlation for the two series is -0.01 and the R-squared statistic 0.000, indicating no material relationship between NEI and next-week stock market return. In other words, the index offers no information about stock market return the next week. Might the sentiment measure be more useful at longer horizons? When stock returns have been strong (weak) over the last 13 weeks, and especially over the last month, NEI tends to be relatively high (low). In other words, survey respondents tend to be near-term trend followers. NEI does not meaningfully predict stock returns over the next quarter. 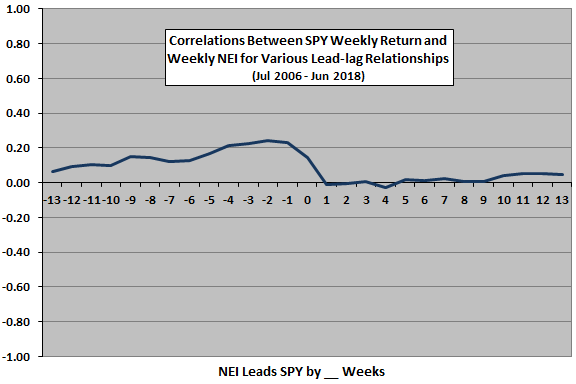 In case there is an exploitable non-linearity in the relationship, we consider average next-week stock market return by ranked fifth (quintile) of weekly NEI values. 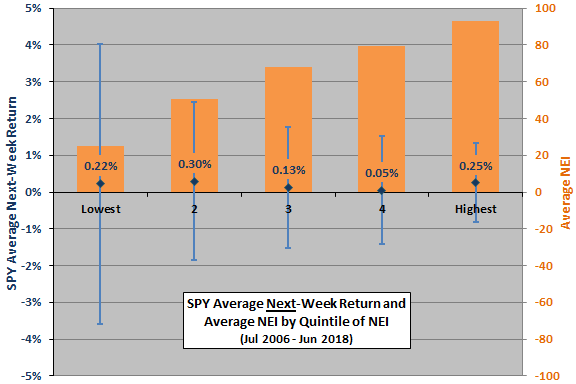 The next chart summarizes average SPY next-week return by quintile of weekly NEI over the entire sample period (124 observations per quintile), with one standard deviation variability ranges. The average weekly return for all weeks is 0.19%. Average returns do not vary systematically across quintiles. The best (worst) average return occurs after average investment posture is somewhat low (somewhat high). Variability of next-week returns does decrease systematically as NEI increases (from standard deviation 3.80% to 1.07%). The chart also shows average NEI Index by quintile of the index. Average NEI is positive even for the lowest quintile. Results suggest that active investment managers may be able to predict stock market volatility, but not near-term returns. A possible interpretation is that these managers tend to miss much of strong market rebounds (in quintile 2). Does the ability to predict volatility translate to good performance? NEI – each week allocate (prior-week NEI)/100 to SPY and the balance to cash. The numbers 0 through 100 on the horizontal axis indicate NEI thresholds for being in stocks or cash. 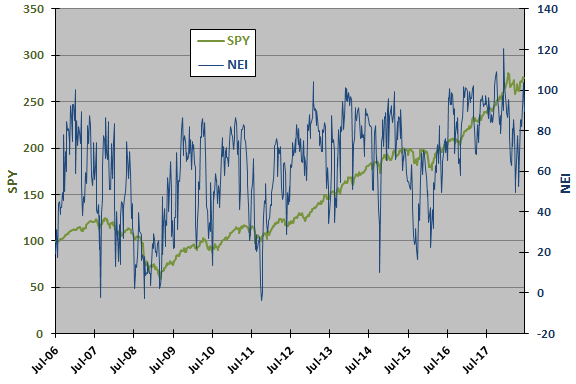 For example, 30 means being in SPY (cash) when the prior-week NEI is above (at or below) 30. Strategy trading frictions may be material. The NEI strategy reallocates weekly (621 times). The 30 threshold (highest Sortino ratio) switches between SPY and cash 49 times over the sample period (about 4.1 times per year). Testing many binary switching thresholds on the same data introduces snooping bias, such that the best-performing strategy overstates expectations. Weekly NEI signals may not be available in as timely a manner as assumed. The sample period is short, especially in terms of number of bull and bear U.S. stock market environments. The potentially unique 2008-2009 crash may heavily influence timing outcomes. With these cautions, buying and holding SPY may be preferable to typical expert active allocation. 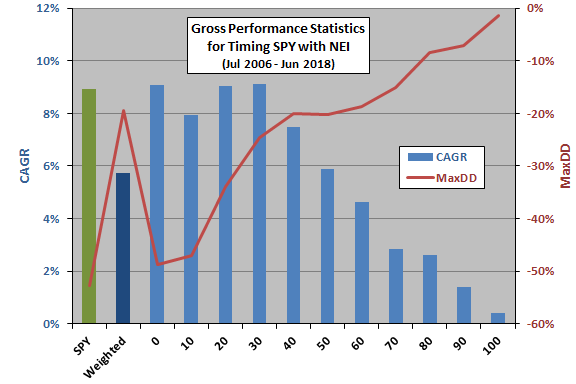 In summary, evidence from simple tests on NAAIM survey data offers little support for belief that active investment managers as a group successfully time the U.S. stock market over the near term, but they may add some value by predicting stock market volatility. As noted, the number of survey respondents is not large and may not be representative of active investment managers. As noted, survey respondents may change their positions quickly (less than a week), such that weekly return measurements do not capture their actual timing performance. As noted, applying NEI to time the stock market involves trading frictions and may introduce data snooping bias. The above tests do not address long-term asset allocation decisions or asset selection, which might produce portfolio outperformance even without successful near-term return prediction.